Think about all the things that you did after you woke up today. First, you probably got out of bed shortly after waking up. You may have used the bathroom and fixed yourself some breakfast. Perhaps you took a shower before you got dressed. Maybe you took some prescription medication for acid reflux, blood pressure, or thyroid problems. After some personal grooming (like brushing your teeth, combing your hair, putting on make-up, etc.) most people got into their car to drive to work or school. Maybe you stopped at an ATM on the way to get some cash or perhaps went on the Internet after you got to work to pay some of your bills online. Now, imagine for one minute that you have a developmental disability. Because of a physical or cognitive limitation (such as autism, mental retardation, or cerebral palsy, for example), you must rely upon another person to do all or many of these things for you. Imagine that some of the most personal, intimate, and confidential parts of your life will now require the assistance and involvement of another person. Sometimes this other person will be a family member while other times it could be a complete stranger who is paid to help you do these things. If these people are not willing or able to meet your needs in a safe way, then you are at great risk of being abused, neglected or exploited. As we look at statistics and the factors surrounding abuse, neglect, and exploitation, it is important for us to always keep in mind that there are real people behind all the numbers and research studies…real people whose lives have been turned upside down by the crimes committed against them by the very people upon whom they rely to care for them. Below are two real-life stories which are based upon actual incidents. Imagining yourself in the place of these two individuals will hopefully instill within you a greater sense of urgency and understanding in regard to the problems many people with developmental disabilities are forced to deal with on a daily basis. I am Kristen and I have a cognitive disability. I am nonverbal and live in a group home. Since I am the resident who has lived there the longest, I do not have a roommate. One of the house rules is lights out by 10:00 p.m. Most of the other residents are asleep by 10:30 p.m. On occasion, one of the staff members comes into my room around 11:30 p.m. and forces me to touch him sexually and he touches me sexually. He tells me he chose me because I am the prettiest and nicest resident, and that I am special and it is an honor to have him come into my room. He tells me that he is helping me experience sexual pleasure that I would not experience without him. However, to not hurt the other residents' feelings, he tells me not to tell anyone. If I do, he says he will deny it all and come in the night and hurt me. What he says makes sense and I guess I should thank him, but I cannot figure out why I do not feel good about the situation. I wait in fear every night in the dark. 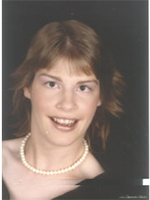 I am Shelia and I have cerebral palsy. I have some movement in my arms and cannot speak. My mother helps me get dressed every day. However, when she helps me out of bed in the morning, she pulls me by my arms with extreme force. She bathes me in HOT water and washes my hair with her nails to the point that it brings tears to my eyes every day. She also lets shampoo run into my eyes. At mealtime, she helps me eat, but she feeds me the same cold apricot baby food for every meal. She never really pays attention and stuffs too much in my mouth before I have a chance to swallow the last few bites, sometimes causing me to cough and choke. My mom scares me and I do not know what to say or whom to tell because she is my mom. Many research studies document over and over that individuals with developmental disabilities have a significantly higher risk of becoming the victims of abuse, neglect, or exploitation as compared to the non-disabled population. Valenti-Hein & Schwartz (1995) estimated that 90% of people with developmental disabilities will experience sexual violence at some point during their lives. Wilson and Brewer (1992) report that women with developmental disabilities are 10.7 times as likely to be sexually assaulted than other women. Sullivan & Knutson (1998) also found that out of all the types of disability, children with behavior disorders and children with mental retardation were both at increased risk for all three forms of abuse (neglect, physical abuse and sexual abuse) compared to those children with other types of disabilities (speech/language disorders, hearing impairments, learning disabilities, health impairments and Attention Deficit Disorder). People with mental retardation and other developmental disabilities are at an even greater risk of sexual victimization. Victims who have some level of intellectual impairment are at the highest risk of abuse. (Sobsey & Doe, 1991). Sexual violence committed against persons with developmental disabilities is particularly widespread in our society. Valenti-Hein & Schwartz (1995) estimated that 90% of people with developmental disabilities will experience sexual violence at some point during their lives. Wilson and Brewer (1992) report that women with developmental disabilities are 10.7 times as likely to be sexually assaulted than other women. It is estimated that nearly half of the population (of persons with developmental disabilities) will experience 10 or more incidents of sexual abuse. However, only 3% of sexual abuse cases involving people with developmental disabilities will ever be reported. (Valenti-Hein & Schwartz, 1995) Other studies suggest that between 39 and 68 percent of girls and 16 to 30 percent of boys with developmental disabilities will be sexually abused before their eighteenth birthday. Estimates indicate that over 15,000 people with developmental disabilities are raped each year in the United States (Sobsey, 1994). Sullivan, P. M., & Knutson, J. F. (2000). Maltreatment and disabilities: a population-based epidemiological study. Child Abuse & Neglect, 24 (10), 1257-1273. Spencer, N., Devereux, E., Wallace, A., Sundrum, R., Shenoy, M., Bacchus, C. & Logan, S. (2005) Disabling conditions and registration for child abuse and neglect: a population based study. Pediatrics, 116, 609�613. In this survey, 342 men with a variety of physical, sensory, and cognitive disabilities who used personal assistance services were participants. Since acquiring their disabilities, 55% had experienced physical abuse and 24% had experienced sexual abuse. Within the last year, 8.5% had been physically abused and 2.5% had been sexually abused. Men with cognitive disabilities were much more likely to experience several categories of abuse (for example, they were 2.5 times as likely as other men to report being hit, kicked or slapped. This study was based on data from the 1995-1996 national study of violence against women. Women with severe disabilities were four times as likely to report beings sexually assaulted as women without disabilities. Oktay and Tompkins (2004) surveyed 84 adults with disabilities who received personal assistance with activities of daily living from family members, informal care providers, and paid agency providers. Survey results revealed that 30% of the respondents had been abused, neglected or exploited by their current care provider. In addition, 61% of those responding indicated that they had been abused, neglected or financially exploited by a previous care provider. Milberger et al. 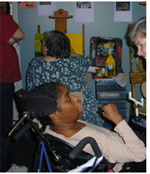 (2003) conducted a study involving 177 women with physical disabilities. Fifty six percent of that group reported having been abused during their lifetime. Of that group, most (89%) were abused on multiple occasions. Only 33% of the women who had been abused ever reported seeking help for their abuse. Why are people with developmental disabilities so often abused, neglected, and exploited? May be physically unable to defend themselves or subsequently report abuse, neglect, or exploitation. May be hesitant to leave abusive situations due to limited availability of accessible transportation and abuse shelters. May have limited incomes and therefore believe they lack the financial means by which to leave abusive relationships. In addition, people with cognitive impairments (such as mental retardation) may not even be aware that the maltreatment which is inflicted upon them by their caregivers (or authority figures) is abusive, unusual, or illegal. Consequently, they may never tell anyone about such incidents. Particularly in regard to sexual abuse, people with mental retardation (who have been exposed to years of education and training intended to foster compliance with requests from authority figures) often think they have no right to refuse unwanted sexual advances and are not taught risk reduction skills (Reynolds, 2001). Some people with disabilities (and/or their loved ones) believe that they only need to be wary around strangers in order to keep themselves safe. However,research clearly shows that the vast majority of individuals who abuse, neglect, or exploit persons with disabilities are actually known by the victim are most often family members or care providers. (Abramson, 2005; Carlson, 1998; Hassounen-Phillips & Curry, 2002; Milberger et al., 2003; Oktay and Tompkins, 2004; Powers et al., 2002; Young et al., 1997). The most common location for abuse, neglect, or exploitation to occur is in the person's home (whether that be their own home/apartment or a licensed residential facility). Research data also indicates that increased risk factors (for abuse, neglect, and exploitation) are present within any settings in which large numbers of people with disabilities are gathered. Despite years of research studies and the shocking prevalence statistics yielded by those studies, there is a marked lack of awareness (among both the general public and even some professionals in disability-related fields) of the national epidemic of abuse, neglect and exploitation. In fact, many people in our society simply refuse to believe that anyone would even consider abusing, neglecting, or exploiting a person with a developmental disability. As discussed below, this limited awareness presents a number of challenges for those individuals and agencies who are committed to preventing maltreatment of these individuals and securing appropriate services in the aftermath. First, an "ostrich in the sand" viewpoint lessens the likelihood that someone who encounters the signs and symptoms of abuse, neglect, or exploitation will subsequently report such information to the Florida Abuse Hotline or the police. Failure to report suspicions of abuse, neglect, or exploitation (due to the aforementioned disbelief) allows such acts to continue or even escalate in their intensity and frequency. Secondly, when case workers, law enforcement officers, counselors and advocates in the fields of both sexual/domestic violence and developmental disabilities are either poorly informed about the problem, or have little experience working with individuals with developmental disabilities, the provision of timely and appropriate post-incident services is unlikely to occur. Law enforcement officers are often the first responders in the aftermath of crimes committed against persons with developmental disabilities and the adequacy of their training (in regard to the needs and characteristics of this population) is essential in facilitating successful investigations and prosecutions. Staff of sexual/domestic violence agencies need specialized materials and information in order to render services to individuals with developmental disabilities who have been abused. Those working in disability-related fields also need information and training to most effectively deal with individuals with developmental disabilities who have been victimized. Finally, lack of acknowledgment (of the pervasiveness of this societal problem) offers little incentive for families, teachers, service providers, advocates, and others to provide information and training to persons with developmental disabilities on self-protection/risk reduction skills. Extensive research in this area reveals a clear correlation between the provision of such consumer education and decreased vulnerability to abuse, neglect, and exploitation. However, many people are reluctant to initiate such sensitive and potentially awkward conversations with persons with developmental disabilities if they don't believe there is a compelling need to do so. As a result, many people with disabilities live most of their lives without ever receiving information and education about abuse, neglect, and exploitation as well as personal safety strategies. Instead, they are quite often taught to be compliant, obedient and passive to wishes of others and have never received education about boundaries or that they have a right to say "no" to painful, inappropriate, illegal or unwanted interactions with others. Once abuse, neglect, or exploitation occurs, a person with a developmental disability has to navigate a complicated system that is not always equipped to handle their special needs. First, an individual must either be trained to recognize and/or report such maltreatment themselves or rely upon a caregiver to recognize the physical or behavioral signs and make a report. Next, DCF adult and child protection staff must be trained to effectively investigate allegations involving victims whom may have communication difficulties or cognitive impairments. Law enforcement officials who respond must be familiar with issues involving capacity to consent, communication difficulties, mental retardation, guardianship, etc. Medical professionals who conduct forensic exams to gather evidence must be comfortable and familiar with methods to assist individuals as they undergo an emotionally difficult and confusing experience. Prosecutors are then faced with victims who are often unable to testify on their own behalf or are not considered credible when they do testify. They are also faced with issues involving competency and capacity to consent. A breakdown at any step of this continuum can lead to failure to prosecute the perpetrator. This often begins the cycle of abuse, neglect, and exploitation anew, as the perpetrator is free to continue harming others, ever more confident that his or her crimes will go unpunished. ² This information, as well as other research studies, may be found at icad.wordpress.com which is a website devoted to providing information about violence and abuse in the lives of people with disabilities and providing a platform for discussion on what can be done to control these problems. 4 Fitzsimons. Combating Violence and Abuse, 37-40. 5 Steinberg, R. and Hylton, L. (1998). Responding to Maltreatment of Children with Disabilities: A Trainer's Guide. Portland: Oregon Institute on Disability and Development. 6 Fitzsimmons. Combating Violence and Abuse, 29. 6 Fitzsimmons. Combating Violence and Abuse, 40.